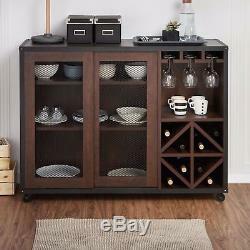 Walnut Finish Sliding Door Buffet Server Storage Cabinet Sideboard Wine Rack Bar. A unique design that effortlessly organizes your dining essentials, this buffet table provides a creative alternative to the traditional servers. Dual sliding doors with crisscross wiring offer a peek at your stored items while an open side compartment features multiple storage opportunities for stemware, mugs and wine bottles. Set includes: One (1) buffet server. Two (2) stackable sliding doors for easy access to stored contents. Three (3) open shelves behind sliding doors. Three (3) rows for hanging stemware. Open side shelf with ample room to store mugs or dishes. 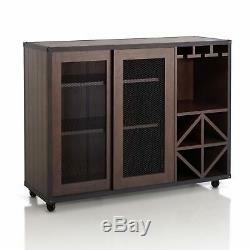 Eight (8) angled storage cubbies for placing standard size wine bottles. Mobile caster wheels for easy maneuvering around dining area. Plank style top and side panels to mimic a rustic visual. Added wood framework along edges and adorned with bronzed nailhead bolts. Inner shelf dimensions: 30.3 inches wide x 13.2 inches deep. Stemware compartment dimensions: 12.7 inches high x 14.1 inches wide x 15 inches deep. Bottle compartment dimensions: 7.3 inches high x 6.7 inches wide x 15 inches deep. Overall dimensions: 36 inches high x 47.2 inches wide x 15.7 inches deep. The Clearance Castle is an authorized reseller of this item. A kingdom of affordable, top quality items awaits! Thousands of satisfied customers since 2001. Here at The Clearance Castle, we search far and wide to bring you the most amazing selection of products. We offer low prices with service that is second to none. Thanks so much for your business and happy shopping! Check back regularly for our latest and greatest offerings! We strive to provide the absolute best in customer service. We will quickly and painlessly solve any issue that may arise in a professional and courteous manner. Office - Houston, TX ; Warehouses across the U. 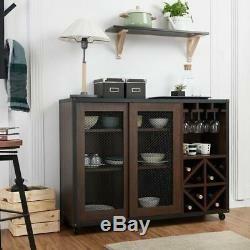 The item "Walnut Finish Sliding Door Buffet Server Storage Cabinet Sideboard Wine Rack Bar" is in sale since Saturday, September 30, 2017.